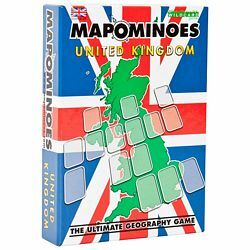 It's like dominoes but with maps, as you build a map of the United Kingdom, by connecting counties that share a common border. Stay one step ahead of your opponents, as you race to be the first player to play all your county cards on the table and win the game. Block access to the Scottish Borders by holding on to Northumberland or Cumbria or open up Wales by playing Powys. Take a boat through the Irish Sea to Northern Ireland or travel by train through Surrey to Hampshire or Berkshire. Ty not to get cut off in Cornwall, stuck on Shetland or isolated on the Isle of Anglesey, as the county cards spread across the table. The excitement builds as you have fewer and fewer cards left to play, but less space to play them in as you reach the table's edge! Every county card is different and hence no two games are ever the same in this clever game that you will want to play again and again.